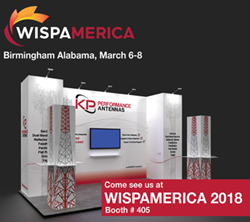 KP Performance Antennas, a manufacturer of wireless internet service provider (WISP) antennas and accessories, announced today that it will be exhibiting at the 2018 WISPAmerica conference in Birmingham, Alabama, March 6th through March 8th. Each year, WISPA, an industry advocacy organization, hosts two exhibitions and trade shows to promote the development, advancement and unification of the wireless internet service provider industry. This year, WISPAmerica will be held in Birmingham, which acts as a centralized location for many WISPs in the southern part of the country. As a member of WISPA and an annual participant in these industry shows, KP Performance Antennas is a well-respected manufacturer of antenna products used by hundreds of well-known customers throughout the USA and Canada. At this year’s show, longtime customers and potential clients visiting the show will be able to learn more about and see firsthand the many products and solutions offered by KP Performance, such as various sector antenna designs, reflector dishes, feed horns, Omnis and other items on display. KP Performance Antennas will be exhibiting at WISPAmerica 2018 and can be found at Booth #405 on the exhibition floor. For more information about KP Performance Antennas, visit the company’s website at https://www.kpperformance.com.